Art Plumbing, AC & Electric provides an all-inclusive range of plumbing services, catering for your every plumbing need. Our certified plumbing technicians are friendly, professional and highly skilled, bringing you only the best in residential and commercial plumbing services. From emergency drain cleaning and leak repairs, to fixture installation, fiber-optic plumbing inspections, and sewer and gas line re-piping, Art Plumbing, AC & Electric is here to meet your every plumbing needs, providing outstanding plumbing services. Emergency plumbing problems are incredibly inconvenient. They will disrupt your water supply, create unpleasant odors, and cause permanent damage if not properly dealt with. At Art Plumbing, AC & Electric, our emergency response teams have the necessary expertise, equipment, and experience to ensure any plumbing emergency you face is effectively dealt with. Give us a call on 1-800-475-1504 to experience our fast, reliable, superior quality emergency services for yourself. Constant drain blockages could be a sign your main sewer line is either obstructed or is suffering from pipe deterioration. We will perform a fiber-optic video pipe inspection and determine whether you require a full line or partial line sewer repair. Consult our expert sewer technicians today to solve this problem sooner rather than later! Pipe leaks can result in permanent water damage, mold growth, and even health risks for you and your home. It is vital to address water leaks as soon as possible, so don’t hesitate to give us a call if you detect a leak, and we will ensure the problem is immediately and effectively resolved. Slab-type home construction, in which the home’s plumbing is run under a concrete foundation slab, is common in Florida. If you are experiencing damp odors, a swampy yard, or increased water bills, your under-slab pipes could be leaking. If this problem is not addressed, costly long-term damage could result. At Art Plumbing, AC & Electric, we use cutting edge technology to detect and repair slab leaks without causing major structural disruption to your home, saving you great expense and inconvenience down the line. If you’re experiencing slow drains, clogging, foul odors or flooding, these are sure signs that your drain needs clearing. Our fully licensed and expert drain technicians will use camera inspections and high-pressure hydro-jetting techniques to clear any drain, on any day of the week, for long-lasting results. We offer a one-year stay-clear guarantee for total peace of mind. If you’re buying or selling a home, or want to ensure you avoid any potential plumbing problems, contact us today to request a comprehensive plumbing system inspection. We’ll advise on any possible repairs and estimate their cost. Our inspection techniques rely on advanced fiber-optic camera technology, which allow us to effectively check for leaks, corrosion, tree root blockages, and general connection condition, saving you costly repairs down the line. Remember, prevention is the best cure! Smoke testing is highly effective for the pinpointing of odor sources. Art Plumbing, AC & Electric offers smoke testing services to help you detect and prevent sewer gas leaks, which can create unpleasant ‘rotten-egg’ smells and even lead to exposure to dangerous hydrogen sulfide gas. If there’s an unbearable odor which you can’t eliminate, call our expert smoke testing technicians today for smoke detection services – and sensory relief! Bathroom and kitchen sinks: We have a variety of beautiful sinks to choose from, perfect for any remodeling project, and will ensure their professional installation. Dishwasher, washer, and dryer installations: We’ll install your appliances properly to avoid any potential damage, and offer annual inspections to ensure they remain in working order. Garbage disposals: If your garbage disposal is making strange noises or not functioning properly, we’ll inspect it and replace it if necessary. Shower and bathtub installations: We are renowned for our years of experience in shower and tub replacements and repairs, and have the expertise to assist in any bathroom remodeling project. Toilets and Bidets: We offer a selection of low-flow and high-efficiency toilets, and provide top quality installation, replacement and repair services. Instant hot water dispensers: We install instant hot water dispensers such as InSinkErator®, so that you can have instant hot water flowing from your kitchen sink, saving you time, water and money. Water, sewer and gas lines can deteriorate over years of use and crack or break, causing water and gas escape and wastage, which is often reflected in increased utility bills. Art Plumbing, AC & Electric has over thirty years’ experience in water, sewer and gas line replacement. Our technicians are also experienced in first-time gas line installation for BBQs, kitchen appliances, water heaters and other fixtures. We supply and install automatic water shut-off valve systems, which allow for wireless flood detection, and PipeBurst Pro™ automatic water protection systems, complete with remote leak-alerting FloodBug and FloMeter technology. We also install the HydroClear 3000 into AC unit condensate drains, which uses a flush technology to prevent bacterial sludge build-ups, which can clog condensate drains and cause water damage. We are proud providers of Bioclean® drain cleaners. Bioclean® is a trusted, safe and effective cleaning solution which uses natural bacteria to digest the accumulated waste in your drains within hours, without resorting to hazardous chemicals. 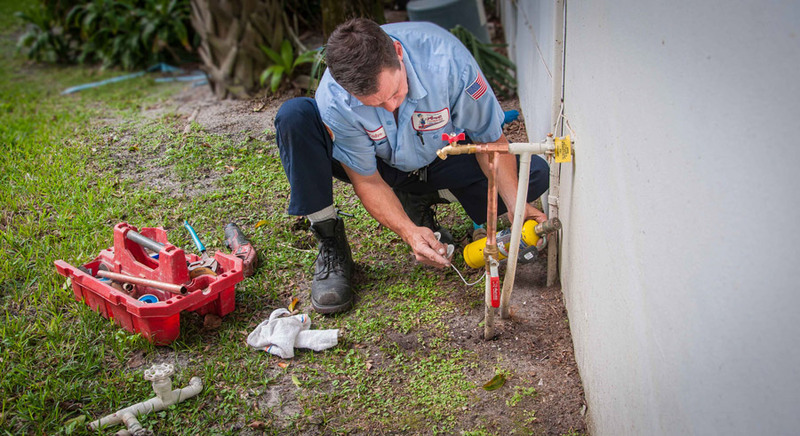 Our certified back-flow technicians will perform the mandatory yearly testing on your backflow device, helping you to comply with city and state requirements and ensuring your water sources remain uncontaminated.